Home FAQ ➞ How do I check my HOA account? The board of directors would like to remind everyone there is a website available which allows you to login and check your HOA account 24/7. 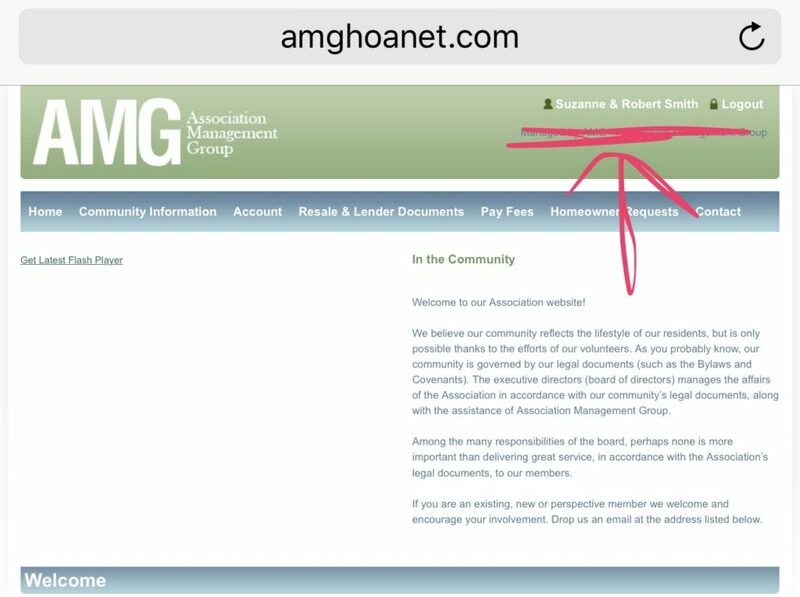 This information was provided to you when we moved from Hawthorne to AMG and is one of the primary requirements the board had for any new management company interviewed by the board in 2014. The same information is provided to new members once their closing attorneys contact AMG and notify them a new owner has purchased a home in Almond Glen. We were surprised to learn so many people did not know they could login to check their accounts. Letters with information related to logging in and checking accounts are being sent out to all members, but this page will serve as a historical reminder. READ MORE BELOW OR WATCH THIS VIDEO FOR MORE INFO. 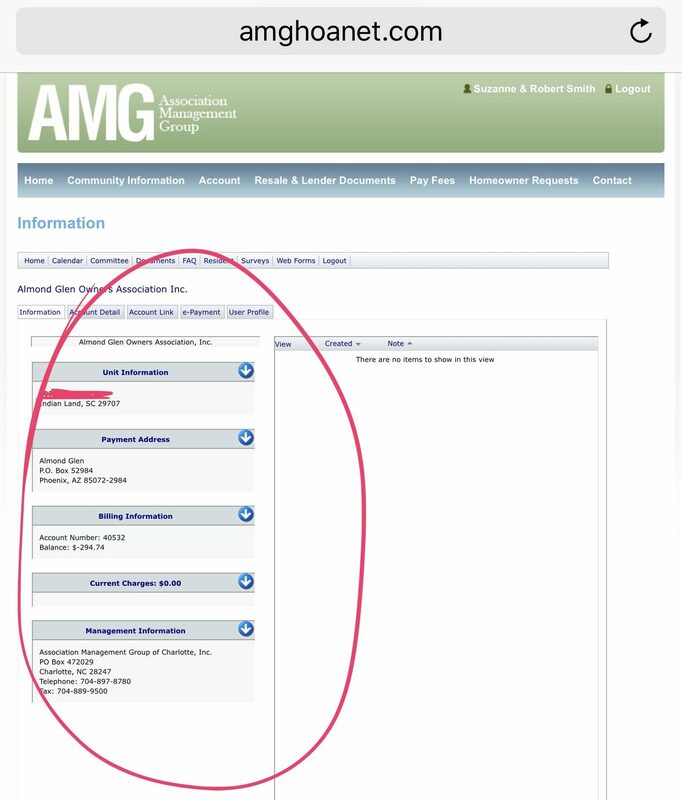 To log in you must visit the Association Management Group (AMG) webpage. A link to the page is conveniently located on the homepage of Almondglenhoa.com. Click the provided link to jump to AMGs webpage. 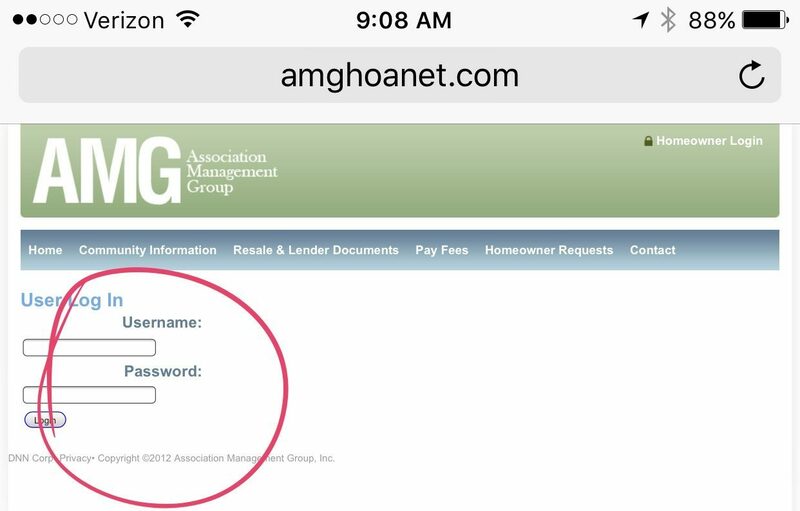 Once you get to AMGs webpage, click the “Homeowner Login” at the top right of the page. After clicking on “Homeowner Login” you will jump to a login page where you can enter your account number and password. If you have lost your login info or believe you never received it, contact Dacy at AMG for help. After you login you will see your name in the area where the “Homeowner Login” was before. If your name is not listed, please notify AMG so updates can be made. 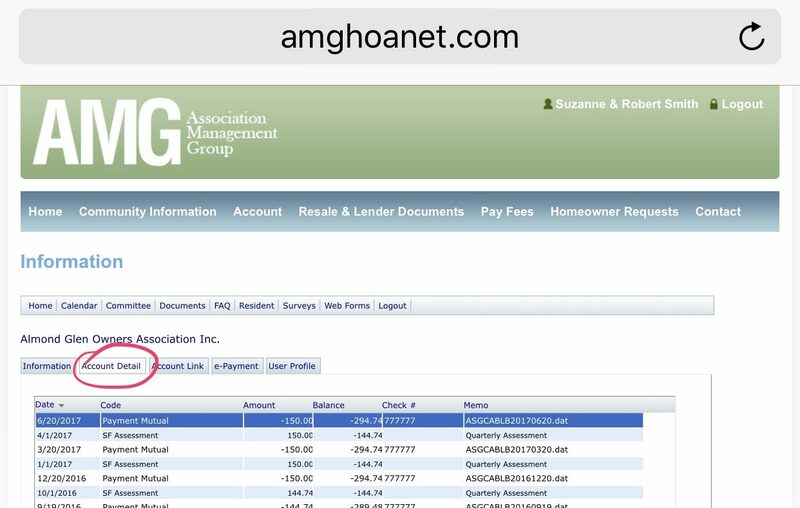 From here you can click on the “Account” tab to see your basic account information (see photos below). One of the new tabs available once you click the “account” tab is “account detail”. Click that tab to review your payment history. As you can see in the example below, I have a negative balance of $294.74 (-294.74). This indicates I have overpaid my dues by $294.74. (I do this to create a buffer to protect myself against late fees or future assessments by the HOA). A positive balance reflects money you owe the HOA. Depending on when you look at your account, you may or may not be late. Generally speaking, you will only see a positive balance if you are behind on your dues. Please reach out to a board member or contact AMG if you have any questions about your account. Remember… We are your neighbors, not the enemy. We want to help!